>>>As the moon grows into a full moon it gives off different levels of energy. Trimming your hair on the right high energy day, will stimulate your hair growth rate. Many find that their hair grows back much longer. So if your hair normally grows 1/4 of an inch each month you could get 1/2 or 1 inch of new growth. Practice healthy hair habits to keep your ends healthy. You also need a regular trim schedule. How often you trim largely depends on what you do to your hair and your care regimen. Hair is a fiber and just like most fibers it becomes worn and weakened over time. This is not a major issue if you maintain a healthy trim regimen. Trimming your hair every 4th month is usually enough to grow long lengths but still keep your ends looking great. If you start your regimen in July with a healthy cut, then you will trim again in October, then again in February, then again in June. Whichever month you do your first cut in, then mark every 4th month from that month as your trim schedule. Writing down a goal holds you to that goal. Choose your high energy day within your trim month. I release the best days to trim each month, usually a week before the first high energy trim date for the month. Be subscribed in order to get the notifications. Never heard of New Moon Phase trimming? But you would like to know more? 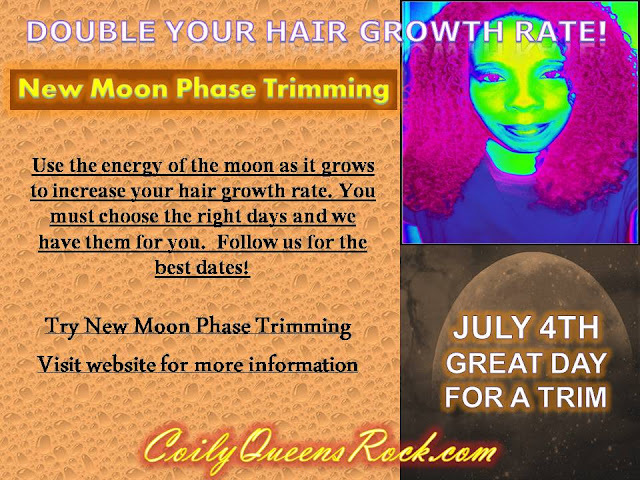 CLICK HERE FOR MORE DETAILS ON NEW MOON PHASE TRIMMING FOR INCREASE HAIR GROWTH!!! Mark your calendars for your trim date. I trimmed my hair today September 5th. Is today a good day to trim? I read on a few websites that trimming during the waxing moon phases are best. Is that true. It has to be specific days during the New Moon phase as it grows into a full moon. So not just any day during the waxing phase but specific days picked by a good source.